Given by Dame Bridget D'Oyly Carte. 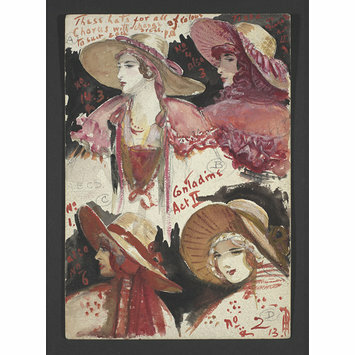 The V&A wishes to acknowledge the generous support given by The Gladys Krieble Delmas Foundation, which facilitated the cataloguing of the D’Oyly Carte Archive designs in 2015/16. 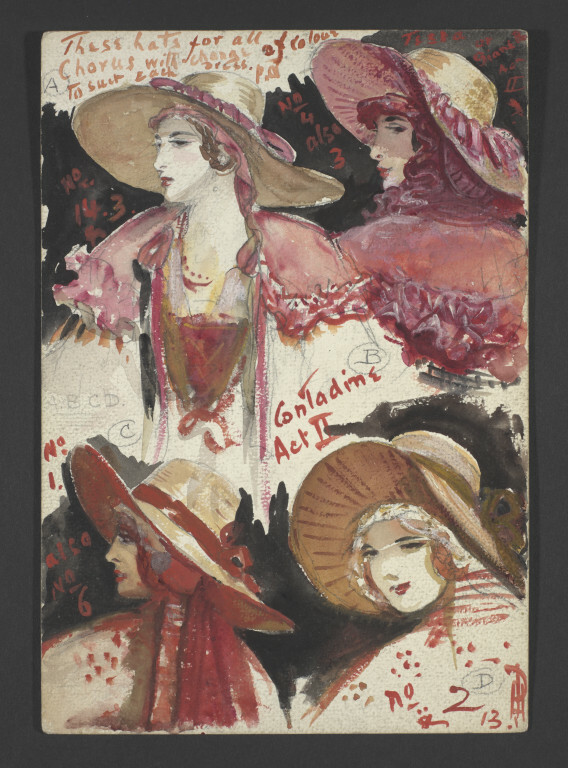 Costume design by Percy Anderson for the hats of the Contadine in Act II from The Gondoliers, tour, 1918. Watercolour and bodycolour over pencil on card. The design features for figures; one three quarter view, on back view, one profile and one three-quarter from the back view showing design for a hat. Design originally used for tour Birmingham 23 December 1918, and subsequently Princes Theatre, 29 September 1919.